The page on the model maker Asylum FX's website shows some stills of a model used in the production of the movie Enemy of the State. We fabricated a 15ft long satellite model for motion control filming on Tony Scott’s ‘Enemy of the State’. It was suspended from the roof of the studio and was filmed from multiple angles to produce the variety of shots in the film. Extensive reference was taken from real satellites in various national museums, to achieve the realistic finish to this unique design. Is this at all based on the design of a realistic satellite, or are four big engines opposite a giant dish with a cylindrical secondary reflector, (never mind that it seems to do optical imaging using the dish) not consistent with any known design? It's a Hollywood movie who's plot is based on the interaction between characters on the ground and the model is used only in brief shots to convey a general idea, and so it needs to create an impression rather than be technically correct. Still, the model is "cool looking" and I wondered if there's anything that even looks like it in reality. Click images for full-size, detailed views. 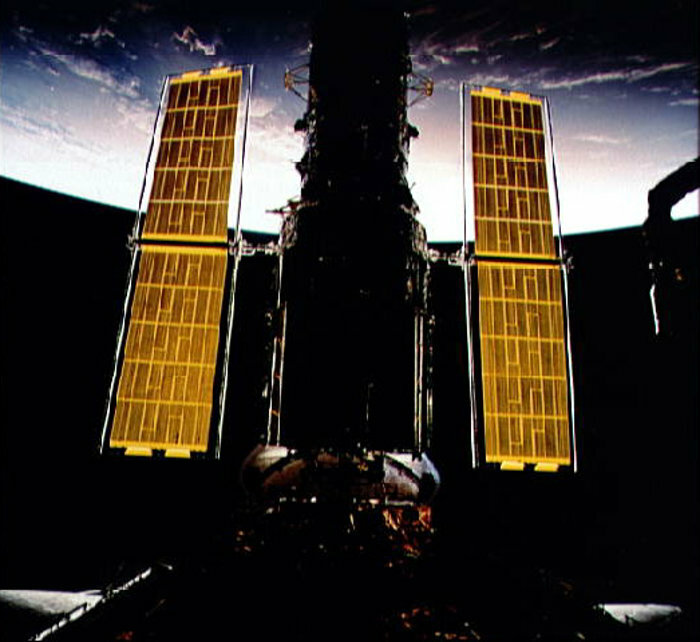 While the appearance of real spy satellites is generally classified, it's generally thought that there's a lot of commonality between the Hubble Space Telescope and the later Keyhole series satellites. 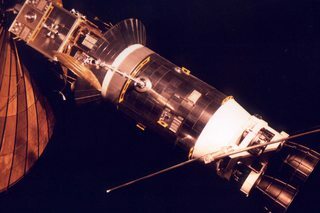 Some similarities are obvious; the aft cylindrical section of Hubble matches the midships portion of the model; both designs have narrow rectangular solar arrays; the small dish comm antennas look quite similar. The large dish on the model, of course, doesn't make sense for an optical satellite, though I guess the film implies it's gathering SIGINT also. It's slightly reminiscent of the folding antenna on Galileo or the radiotelescope Spektr-R. 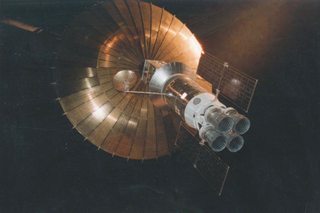 The model features small quad thruster arrays that look very similar to those on the Apollo CSM; a real spy satellite would more likely use a reaction wheel or CMG system for attitude control -- no propellant to consume, no exhaust products to fog the mirrors. The four large engine bells are silly. While you might want a thruster for orbital adjustments, you'd use a much smaller engine with a simpler nozzle -- maybe two if you wanted redundancy, but not four. You wouldn't keep the dead weight of an orbital insertion stage attached to your spacecraft if you intended to do any attitude control maneuvers. The layout is similar to the Russian 4-chamber engines, but the nozzles are probably inspired by the SSME. To me the portion of the craft below the upward tilted "skirt" looks like an upper stage. Most like a Centaur but none of them had 4 engines. 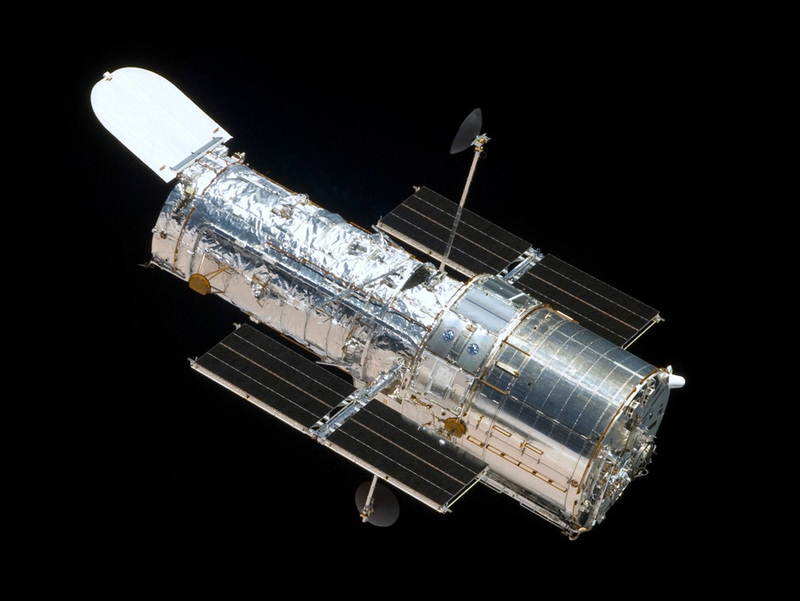 And certainly no Hubble-esque solar arrays attached to the engine mounts. Some upper stages remain attached to their payload and provide services long after reaching their initial orbit. 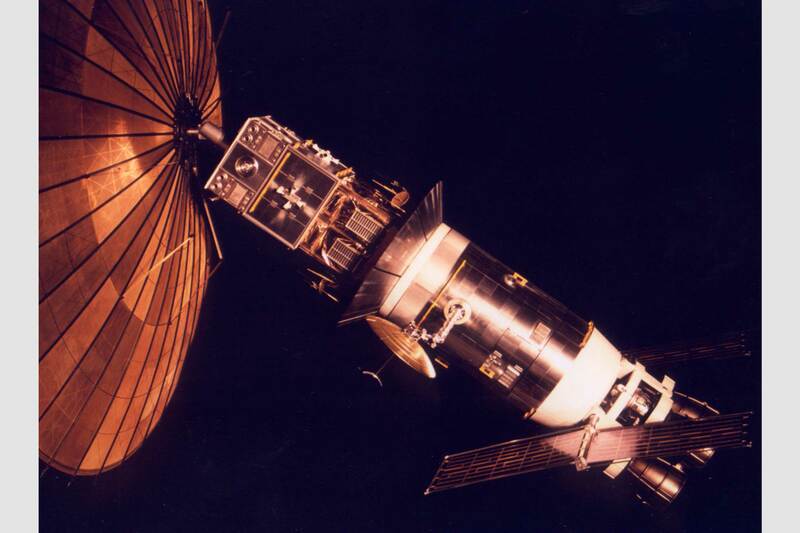 Many early American intelligence spacecraft, for instance, remained attached to their Agena upper stage throughout their operational life. The Agena would provide the spacecraft with power, communications, and attitude control, as well as providing orbital maneuvering as needed. That said, it looks very little like an Agena and instead this looks totally Hollywood-ized and targets the cool factor rather than realism. Not the answer you're looking for? Browse other questions tagged identify-this-object space-art space-surveillance or ask your own question. Who is the NASA Space artist of this circa 1978 satellite montage? Does a key listing each item exist? Puzzler; “who” are the members of this family of comet-visiting spacecraft? Is there really moon rock in this cathedral window? If so, how, and from where on the Moon? Was there once a semi-serious space-art project planning to use solar reflectors to put a spot of light on the crescent Moon?